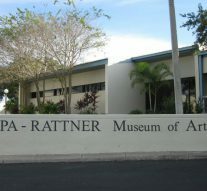 Tarpon Springs, Fla., January 9, 2019— Unique and innovative art-making processes will be the central theme of the upcoming exhibition UNEXPECTED: Art by Alternative Means featuring Nathan Beard, Akiko Kotani and Rob Tarbell at Leepa-Rattner Museum of Art (LRMA), St. Petersburg College, Tarpon Springs, from February 24 – May 19, 2019. This exhibition features the artwork of three Florida artists who employ unconventional techniques. This exhibition is open to the public and included with museum admission ($7 for adults, $6 for seniors, and free to members, children 17 and younger, SPC students and staff with ID and active duty military). The featured artists of this exhibit include Nathan Beard, Akiko Kotani and Rob Tarbell. Beard utilizes a labor-intensive art process using tape as a means to create complex, undulating layers of painted patterns. Kotani is a fiber artist who creates drawings with bamboo silk thread, explores mark-making on glass and crochets a “melting wall” from plastic. Tarbell employs the medium of smoke to create portraits on paper and porcelain. Beard, Kotani and Tarbell will present a gallery talk on Sunday, April 14 at 3 p.m. in LRMA’s Galleries. Event is included with admission. To complement this exhibition, LRMA will have on view mixed-media works on paper by Tampa artist David McKirdy in the permanent collection galleries. Additional exhibitions on view on February 24th include David McKirdy: From the Collection; Rattner and Surrealism; Elemental: Fine Crafts from the Collection; and Made in Florida: The Art of Giving.